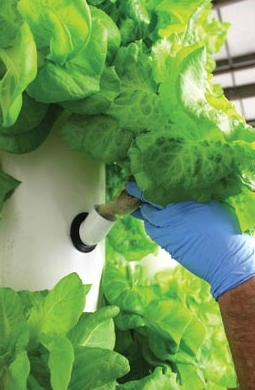 Vertical HydroCycle Aeroponic Systems utilize unique grow tubes that support the flow of oxygen for rapid growth and a nutrient-rich mist for healthy plants. Grow an unbelievable 220 plants in less than 23 square feet! So what exactly is aeroponics? 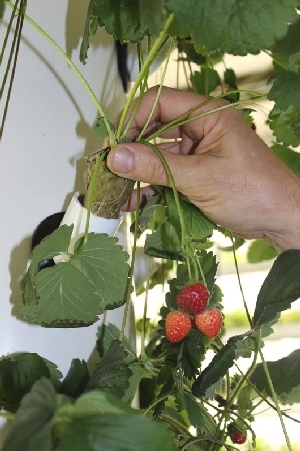 Aeroponics is the process of growing plants in an air or mist environment without the use of soil or an inert growing medium, as traditional hydroponics does. Instead of bathing the plants roots in liquid nutrient solution, the plant nutrition is aerosolized into a mist to which the roots are exposed. Aeroponics is probably the most prolific of the hydroponic methods, promoting astonishingly fast and abundant plant growth. • These compact systems are ideal for gardening in tight spaces and maximum control of the root zones. • Each system comes with an air pump with ceramic air diffusers, Y-fit snap hook tube hangers, all the necessary plumbing and fittings. We offer FarmTek's Vertical HydroCycle Aeroponic Systems at 5% off retail price! • Approximately 20"W x 26"L x 73"H.
• Uses a single vertical grow tube that is 4'8"H and has 24 grow sites. • System comes with a mag-drive pump 20-gallon nutrient reservoir. • Approximately 29-1/2"W x 96"L x 75"H.
• Uses 5 vertical grow tubes that are 4'8"H and contain 24 grow sites per tube (120 total sites). • System comes with a pressure utility pump and a 100-gallon nutrient reservoir. • Approximately 28"W x 39"L x 124"H.
• Uses a single vertical grow tube that is 8'H with 44 grow sites. • System comes with a pressure utility pump and a 20-gallon nutrient reservoir. • Approximately 29-1/2"W x 96"L x 115"H.
• Uses 5 vertical grow tubes that are 8'H with 44 grow sites per tube (220 total sites). • Comes with a pressure utility pump and a 100-gallon nutrient reservoir. CONTACT US for details and specs, shipping costs and how to buy one of these top quality Vertical Hydroponic Aeroponic systems at the lowest possible price. [If you deal directly with us and do not contact FarmTek].